Alcorn, Susan - Women’s hiking website. "Our purpose is to infect others with an enthusiasm for backpacking and long distance walking, and to give them some stories, links and references to make it easier"
American Trails - "American Trails is the only national, nonprofit organization working on behalf of all trail interests, including hiking, bicycling, mountain biking, horseback riding, water trails, snowshoeing, cross-country skiing, trail motorcycling, ATVs, snowmobiling and four-wheeling"
Great Smoky Mountains National Park - The official park website. Christine W. Hartmann - The official website for my wife’s books. Nomad, Nimblewill - The Nomad not only hiked the transcontinental Sea-To-Sea Route but he also hosts an excellent C2C Website. Oboz - Oboz Footwear is a Bozeman, Montana company that makes products that I love to use. I alternate between four different models, using at least one of them almost every day. 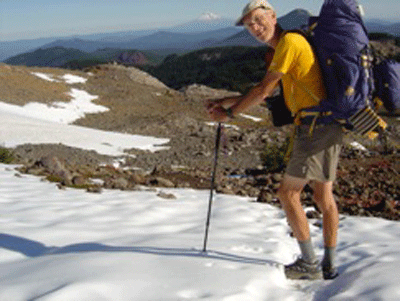 Skurka, Andrew - 2004-2005: first thru-hike of the 7700-mile Sea-To-Sea Route. 2005: Backpacker Magazine's "Person of the Year." 2007:National Geographic Adventure's "Adventurer of the Year"
Trail Foods - Enertia TrailFoods meals are made by outdoor enthusiasts who share my passion for hiking in the great outdoors. I love the taste and convenience of TrailFoods, and I never tire of eating them. The Ultralight Backpacking Site - Information, news, stories, photos and more about lightweight backpacking, outdoor adventures, and wilderness survival.